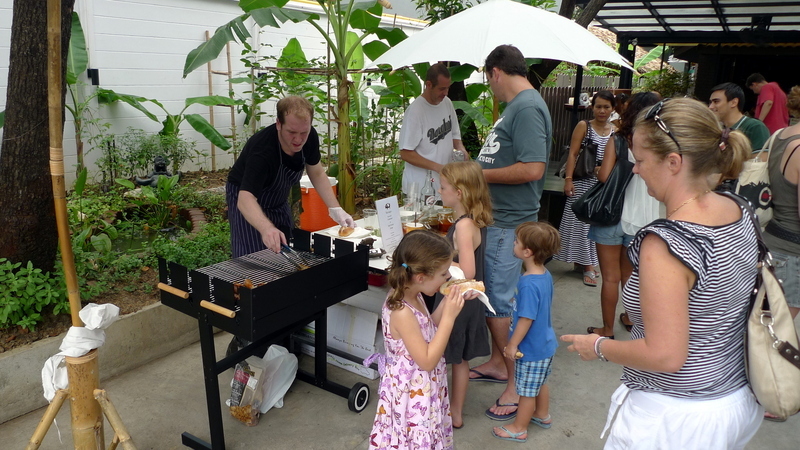 Each first Saturday of the month, the upscale, down-home Thai restaurant Bo.lan hosts a farmers’ market they dub “Eat Responsibly Day.” Located on Sukhumvit Soi 26 in Bangkok, chefs Duangporn “Bo” Songvisava and Dylan Jones’ commitment to slow, local, organic, and sustainable food shines at this market, which is held on the front yard of the restaurant. 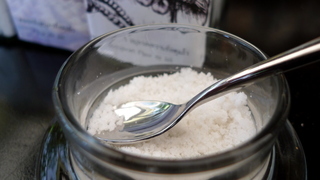 From Samut Songkhram province, one vendor had fluer de sel (sea salt – left) and palm sugar (right). These are two staple products made in the smallest of Thailand’s 77 provinces and I had to chuckle a bit as the palm sugar comes from the sub-district where I used to volunteer as an English teacher. Every time I went down there, it was all I could do not to return home carrying several kilos of the palm sugar. It didn’t occur to me at the time, but I could have repackaged it with a nice label and sold it as an artisinal product! 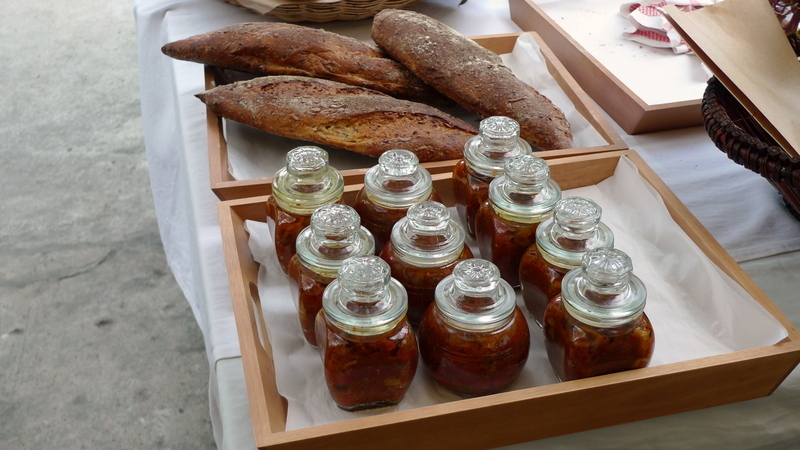 Another vendor was selling freshly-baked bread and jars of homemade roasted tomato relish. This relish was amazing, full of whole garlic cloves and cooked at a low temperature for several hours until the flavors combined beautifully. The lady who makes it brought the recipe back from Europe and has been making it for friends, who would wash and return their empty jars, asking her to fill them up the next time she made a batch. April was her first time at the market, and I certainly hope she returns. 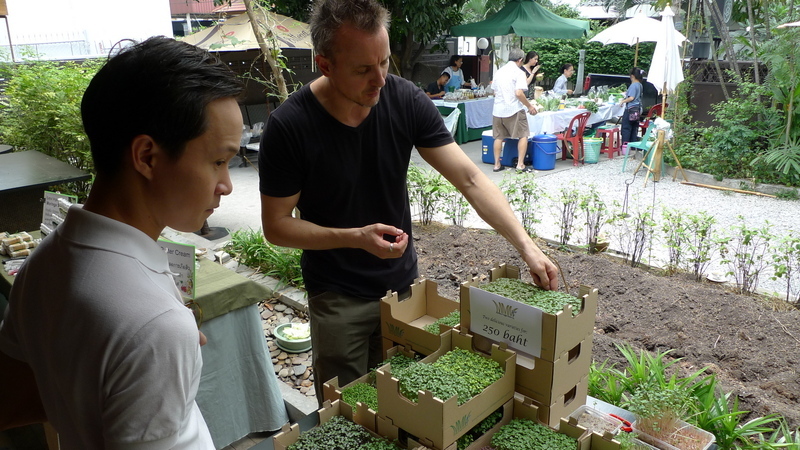 Maarten Kaspersma runs a busines selling microgreens, evenrything from mustard greens to carrot, kale to mizuna. 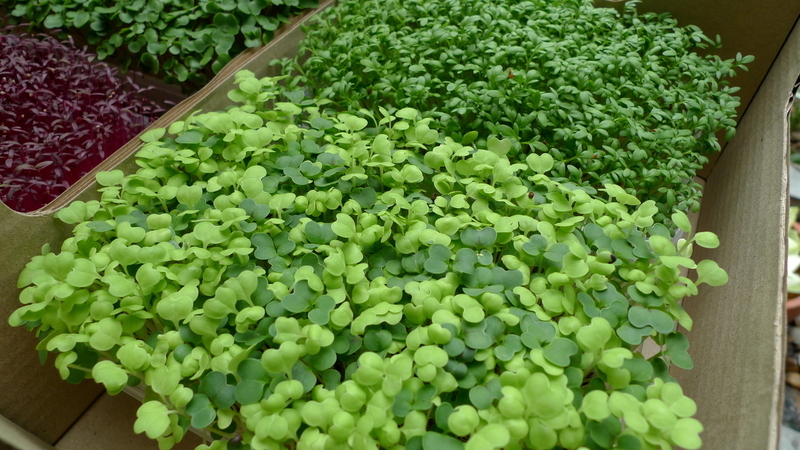 The business name is Mr. Maarten’s Microgreens and you can find them on facebook. Joe Sloane of Sloane’s Sausages made an appearance with his grill. Joe has gained fame around Bangkok as a purveyor of fine pork products. He doesn’t yet have a retail outlet so he informs his customers whenever he has purchased a hog or two (always organic breeds that come from up-country) and has more products for sale. In the near future, he hopes to open a proper storefront so he has more processing space. Cumberland sausages and fresh chorizo. 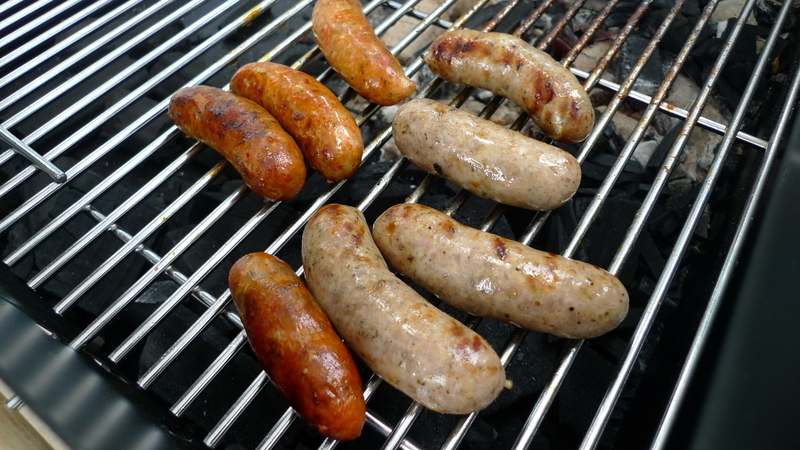 These were so nice, I see no further need for me to experiment with sausage making at home! 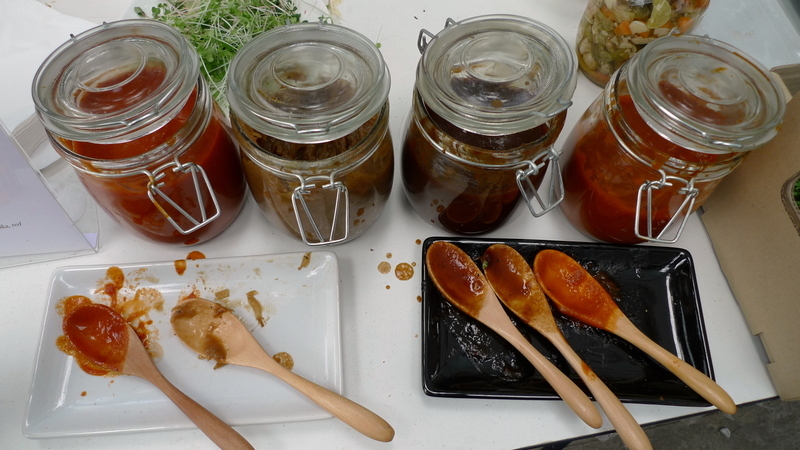 Homemade sauces and onion relish with which to tart up your sausages. 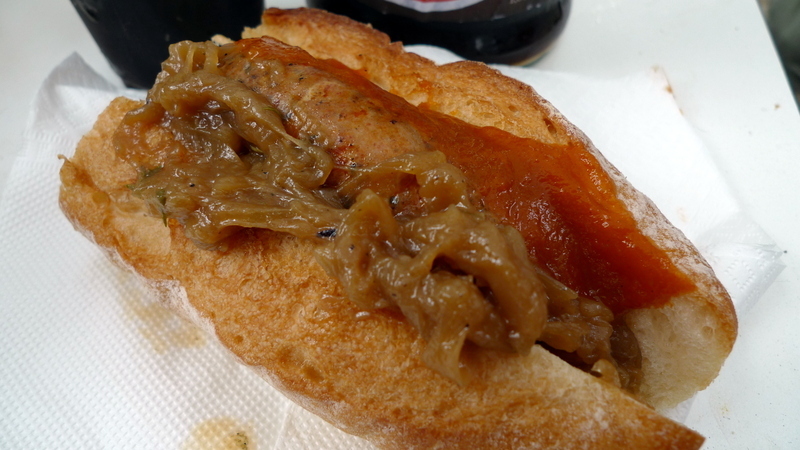 Fresh baguette from Le Blanc on Sukhumvit Soi 39 with a heap of onion relish, fire-roasted tomato ketchup, and a chorizo sausage. Heaven on a Saturday morning. 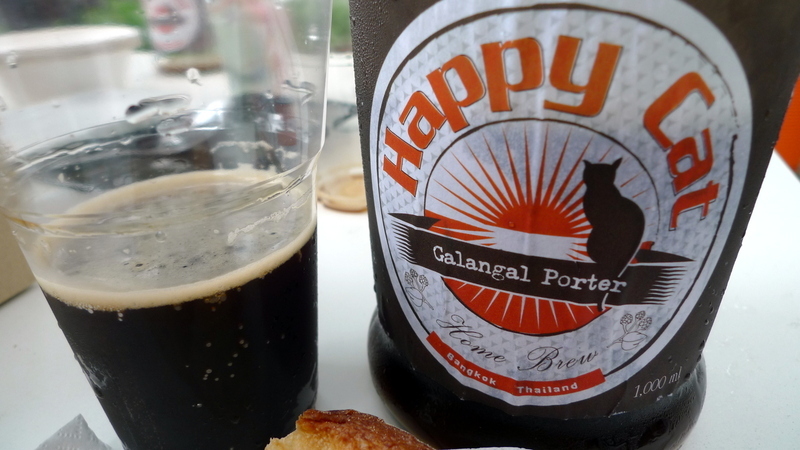 Accompanying Joe Sloane’s sausages was galangal porter, brewed at home by our friend Brian’s Happy Cat label. Hopefully, he will one day turn this into a proper business and make his fine hand crafted brews available for retain sale. 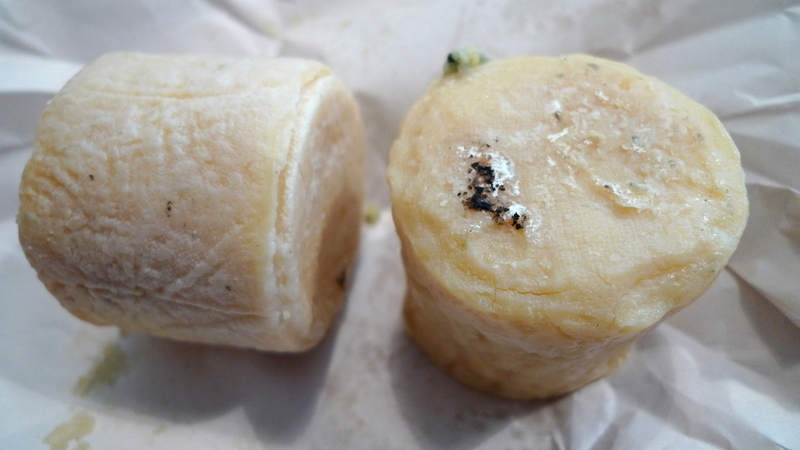 We stopped by the table hosted by Pattaya’s own Lulu and Daisy Goat Cheese company and bought two rounds of medium-aged goat cheese. Nice and tangy, we’ve been shredding this on salads for a wonderful, rich flavor and aroma. Organic, free range eggs. Not sure if I understood correctly that these came from hens that live on the restaurant’s property. Perhaps I’m mistaken. They were tasty, though. The restaurant does have its own mushroom hut and so we purchased mushrooms freshly harvested on-site. While it has been more than two years since I wrote a review on Bo.lan, at which time I found the food very tasty but the prices just a little dear, I have to commend the chefs’ commitment to local and sustainable foods. Quite an emphasis on quality! 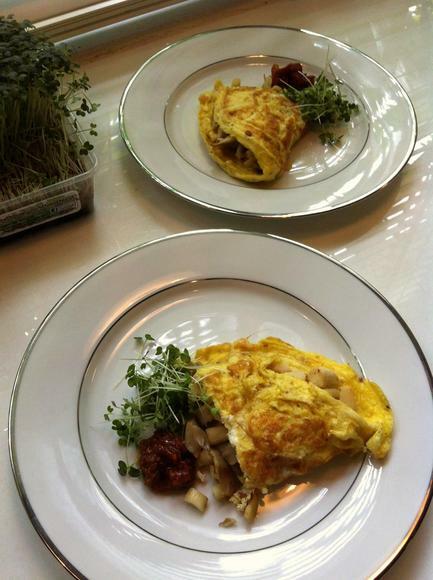 When we returned home, Tawn whipped up an omelet using the eggs, mushrooms, goal cheese, microgreens, and tomato relish that we had purchased at the farmers’ market. Another Eat Responsibly Day will be held on Saturday, 5 May and will continue on the first Saturday of each month at Bo.lan restaurant, Sukhumvit Soi 26. I already have my calendar marked! This entry was posted in Uncategorized and tagged Artisinal, Bangkok, Bolan, Cheese, Farmer, Farmers, food, Goat, Krungthep, Local, Market, Microgreens, Organic, Sausage, Sloane, Sustainable, Thailand by christao408. Bookmark the permalink. Really interesting. I like the thought of micro-greens. I have been trying to eat more sprouted seeds myself. I bought some Organic Chia seeds to add to my foods. I might see if I can get some greens for my Green smoothies. 🙂 Nice Omelet with all that goodness you must have felt that much healthier. Very nice. Thanks for reminding me about microgreens! Nice foodie post. 🙂 I especially like the palm sugar. So yummy!! i’d be in food heaven if i were there. if only we have such market here in jakarta. i’m craving those breads and tomato relish. @rudyhou – Well, if a foodie scene can develop in Bangkok, I’m sure one could take root (eventually) in Jakarta, too. @beowulf222 – Yes… almost San Franciscan, too. 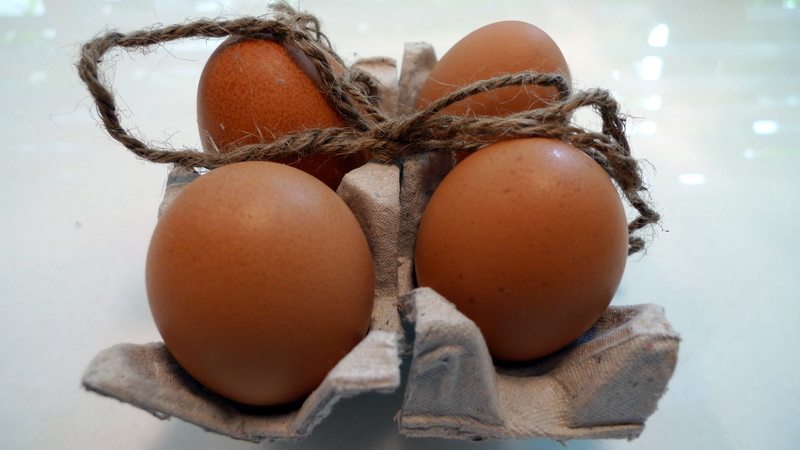 @murisopsis – That must have been fantastic, to have fresh eggs like that. 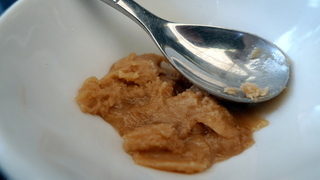 @brooklyn2028 – The palm sugar has a really interesting taste, doesn’t it? Kind of like brown sugar but “fruitier.”@nov_way – My pleasure. Enjoy your microgreens. @Fatcat723 – Indeed you would! Ha ha! @Ikwa – Well, with the eggs and cheese I must confess I didn’t feel all that much healthier afterwards. But I sure felt satisfied! @Passionflwr86 – Yes, and he just changed the label name from the much more generic “Bangkok Brewing.”@CurryPuffy – Oh, Tawn’s always been a perfectly good cook. I just get worked up with the way he cooks – he doesn’t really subscribe to the “clean as you go” theory. Ha ha! 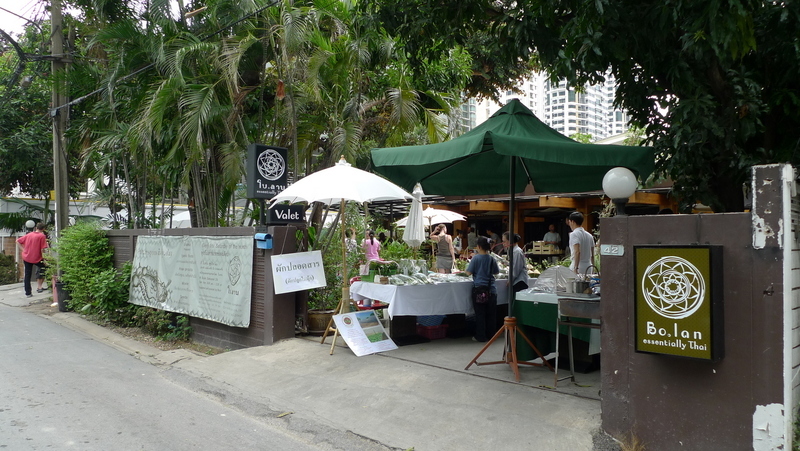 Thanks to show us a farmet market in Thailand! Looks exciting. @christao408 – “clean as you go”….hahaha~that’s funny! There is something really neat about knowing not just from where but from whom one’s food comes. I can’t wait till the farmers’ markets reopen for the season here. Great post. 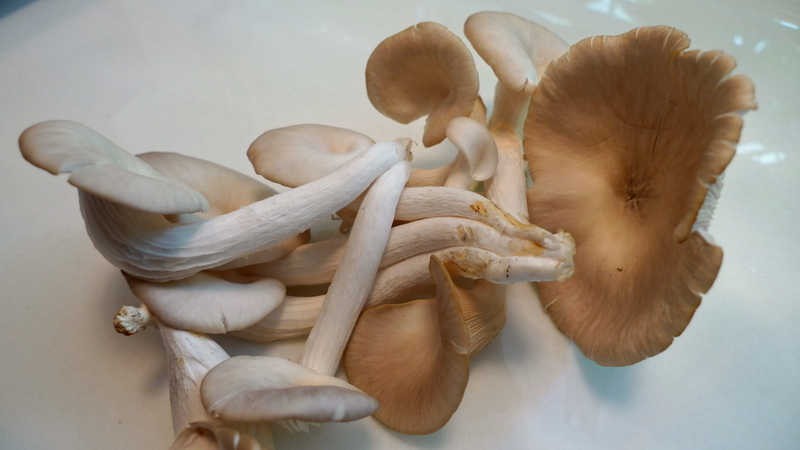 Fresh eggs with some micro greens and fresh mushrooms sure sounds wonderful. I am sure Tawn is a wonderful chef also. as always your food choices are impecable. the tomato relish reminded me of when i was in lancaster pennsyvalnia and bought tomato jam from the amish store. i would love to have some of that relish.i think it would be far superiot to the jam. i grow sweet basil, cilantro, rowemary, and parsley on my patio. i must say i love the fresh herbs espcially the sweet basil in soups and salads but i never dreamed of frow mustard greens what a novel idea. Can’t go wrong with sausages and porter.Seems to be a large gringo community in Thailand. looks delicious! i love little farmer’s market type, local-business markets. the food is usually fresher and of much better quality, and it’s a great way to support your own community.